Call now to talk to an experienced steeplejack. All our flags are available with reinforced corners and extra stitching - That means they last longer. 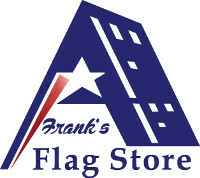 Custom Nylon flags, Custom Polyester flags, Custom single sided flags, Custom double sided flags. We do them all. Teardrop Banners, Bow Flags, and Feather Dancer Flags are among the trademarked products we offer. But our quality is in actuality defined by our digital custom printing, fiberglass pole sets and our wide variety of bases. Our available shapes encompass all of the following alternative names in use today: Action Banners, Banner Flags, Blade Banners, Blade Flags, Blade Runner, Bow Head Banners, Display Flags, Eagle Flags, Event Flags, Feather Banners, Flutter Flags, Fly banners, Flying banners, Horizontal Banners, Sail Flags, Swooper Banners, Tradeshow Banners, Tradeshow Flags, Twirler Flags, Vertical banners, Wind Feather Flags, Wind Flags, Wind Runners, Wind sails, and Wing Banners. 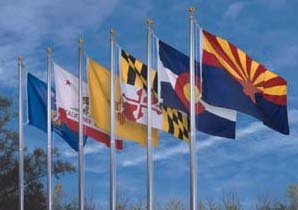 State Flags and World flags proudly made in America by Eder Flag Co., a trusted name for over 100 years. 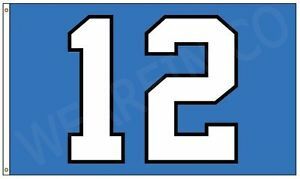 No One Offers More Custom Pennant & Custom Streamer Choices. Los Angeles, CA. San Francisco, CA. Oakland, CA. Riverside, CA. San Bernardino, CA. Sacramento, CA. New York, NY. Chicago, IL. Dallas, TX. Philadelphia, PA. Houston, TX. Washington, DC. Miami, FL. Ft. Lauderdale, FL. Atlanta, GA. Boston, MA. Detroit, MI. Phoenix, AZ. Seattle, WA. Tacoma, WA. Bellevue, WA. Minneapolis, MN. Bloomington, MN. St. Louis, MO. Tampa, FL. St. Petersburg, FL. Baltimore, MD. Denver, CO. Pittsburg, PA. Portland, OR. San Antonio, TX. Orlando, FL. Cincinnati, OH. Cleveland, OH. Kansas City, MO. Las Vegas, NV. Columbus, OH. Charlotte, NC. Indianapolis, IN. Austin, TX. Virginia Beach, VA. Norfolk, VA. Providence, RI. Nashville, TN. Milwaukee, WI. Jacksonville, FL. Memphis, TN. Louisville, KY Richmond, VA. Oklahoma City, OK. Hartford, CT. New Orleans, LA. Buffalo, NY. Raleigh, NC. Birmingham, AL. Salt Lake City, UT. Rochester, NY. Tucson, AZ. Honolulu, HI. Tulsa, OK. Bridgeport, CT. Albuquerque, NM. Albany, NY. Omaha, NE. New Haven, CT. Dayton, OH. Allentown, PA. Baton Rouge, LA. El Paso, TX. Worchester, MA. McAllen, TX. Grand Rapids, MI. Columbia, SC. Greensboro, NC. Akron, OH. Sarasota, FL. Little Rock, AR. Knoxville, TN. Springfield, MA. Joliet, IL. Naperville, IL. Fort Worth, TX. Arlington, TX. Camden, NJ. Wilmington, MD. Sugar land, TX. Baytown, TX. Arlington, VA. Alexandria, WV. Pompano, FL. Sandy Springs, GA. Marietta, GA. Cambridge, MA. Quincy, NH. Warren, MI. Livonia, MI. Mesa, AZ. Glendale, AZ. Bloomington, WI. St. Paul, MN. Clearwater, FL. Towson, MD. Aurora, CO.